In his A Short History of Nearly Everything, the travel writer Bill Bryson calls water a “murderous substance.” Insurance companies have institutionalized their hatred of water, as it is by far the largest cause of insurance loses to homes. They often cancel homeowner policies after just one water damage claim. For energy efficient homes built to retain their heat, water can be truly “murderous.” That’s because the heat that would normally pass through the structure of the house, drying the structure as it flows through it, is instead retained inside the structure. This is a very good thing from an energy-use perspective, but it can be a very bad thing for the health of the house, as moisture retained by the structure can lead to mold and rot. When building a high performance house, special care must be taken to keep water out of the structure of the home. At our Savoy house, we have worked closely with our SIP panel sub-contractor to make sure that the structure is wrapped in such a way so as to prevent as much water entry as possible and to allow what does get in an easy exit. We are putting on a carefully designed drainage plane that allows proper bulk water management outside of the house. The drainage plane consists of a layer of asphalt-saturated felt covered with ¾ inch furring strips. The space created by the furring strips performs a double function. 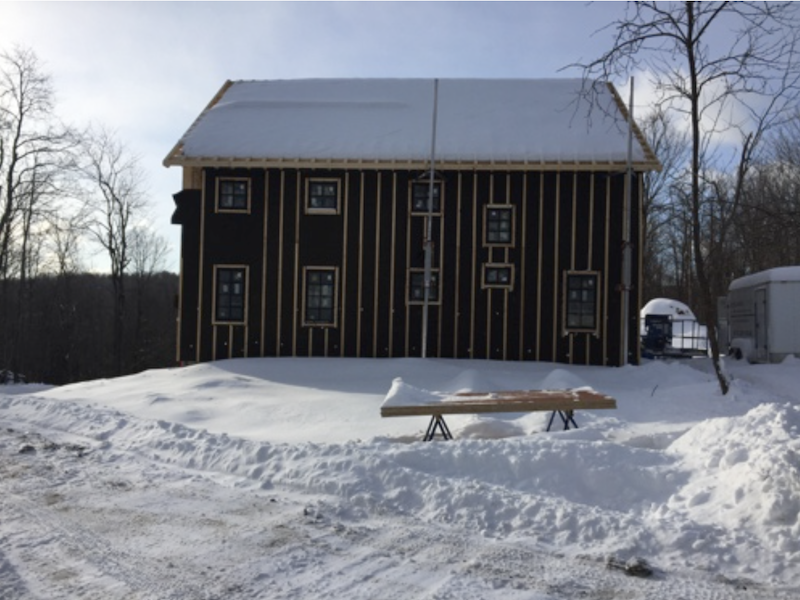 It allows the wind-blown rain that gets behind the siding to drain down the walls of the house before it can be absorbed into the wall panels of the house. 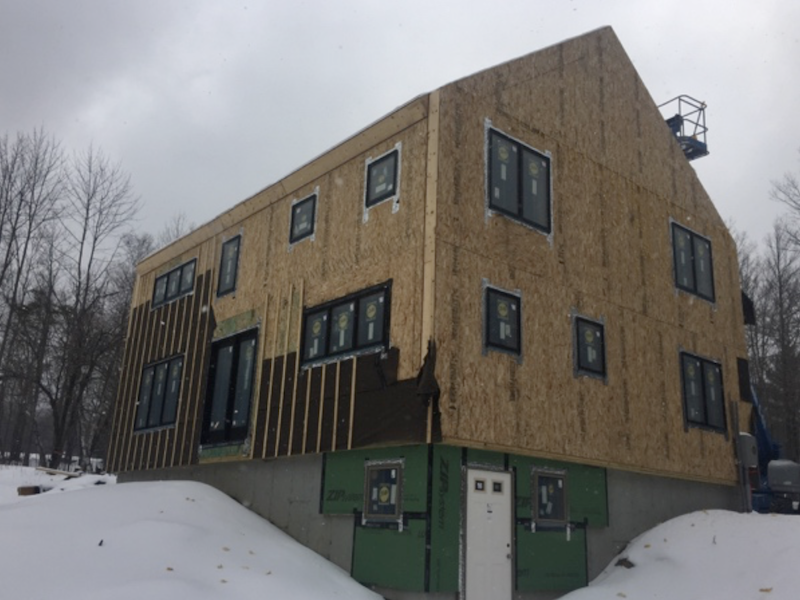 It also allows for air circulation behind the siding, which helps to draw any moisture that did make it into the core of the SIP panels, whether from the inside or the outside, out and away from the panels. Bulk water from the outside can be incredibly persistent in its effort to get inside a building envelope. This is a photo (above) taken from the inside of the house before the felt paper and furring strips were installed. Water easily made its way through the 10” foam core of the wall panels and soaked the sheetrock. The sheetrock, however, dried out nicely once we got the drainage plane fully installed. 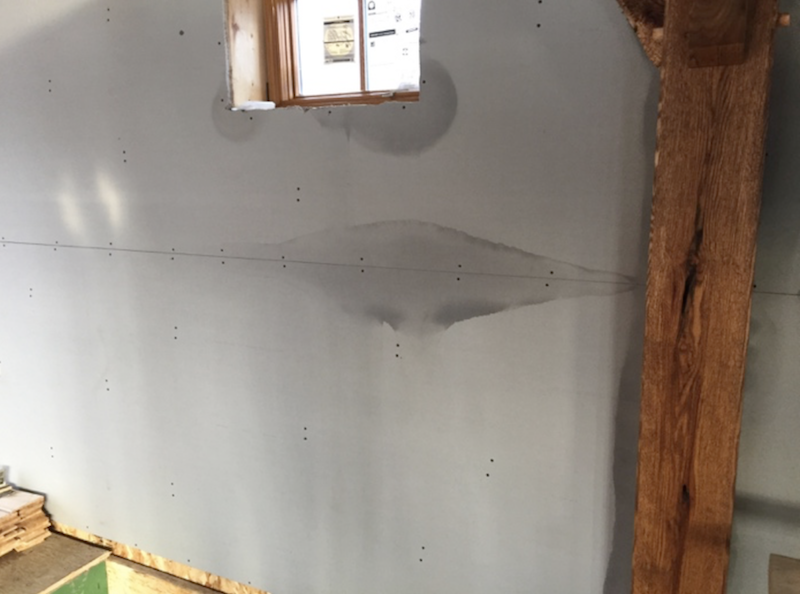 Moisture meter readings of the sheetrock panels and the foam beneath that we have taken over time have dropped down to less than 12%, well within acceptable limits.